If you’re an independent consultant, freelancer or a startup with challenges in the area of driving sales and developing new business, I can honestly say I know what you’re going through. I’ve been there, too. That’s why I’m introducing the S.C.O.R.E(c) Sales System & Training Model for freelancers, independent consultants and startups. When you went into business on your own, you signed up for sales! Maybe you’ve jumped out of the corporate world and you’re on a mission. Maybe you’re looking to be the master of your own universe. Maybe you want to escape the employee life and run your own freelance consultancy. You’re doing your social media and online marketing. You’re speaking at events and building your profile. You’re doing the networking thing. And your business is booming. If so, great. Keep the mojo workin’. But if you’re just not where you need to be in generating revenue… if you’re not really satisfied with the consistent flow of your sales pipeline… if you’re meeting with prospects, but not converting enough of them into happy clients, well, you’re not alone. The cruel reality is that in any new business, the difference between success and failure is sales. Marketing and brand-building are indeed important. But selling is vital. Do you have a solid sales system? Do you have a methodology to your business development efforts? Are you skilled in tactically executing it? Are you building trust by pulling buyers through their purchasing process, as opposed to killing trust by pushing them through your sales process? My journey into sales was an accidental one, too. I was trained as a journalist at Syracuse University’s Newhouse School of Public Communications and, indeed, those communications skills have served me well over the years. But one thing they rarely teach in universities, not even in the vast majority of business schools, is sales systems, methodologies and skills. Out of university and as the editor — and self-appointed food and wine columnist — for a lifestyle magazine near Woodstock, NY, I was recruited by Sebastiani Vineyards of Sonoma, California to manage its sales through wine and spirits distributors in New York State. From editor to sales manager? Say wha’? Sebastiani, then the fifth largest winery in the U.S., equipped me with distributor sales management tools, as well as some tactical selling skills. Before long, I became on-premise sales specialist for the northeast U.S., meaning that I was leading the sales of premium wines to upscale restaurants and hotel chains. I also became a believer in sales training — how it not only provides you tools, but how it also provides you confidence. While I am a wine aficionado, most of my sommelier-level prospects knew much more about wine appreciation than I. And they certainly knew their businesses better than I. So the one thing I did very quickly was to apply one of the tools I had learned in my annual sales training: to ask tactically effective questions. And then, of course, to listen… and to ask more questions, tactical questions. Keep it simple in marketing. Go deeper in sales. While I’m a big believer that sales and marketing should be seamless, we must still distinguish between them. One thing most commercial people agree on is that marketing generates leads. Sales converts leads to paying customers. At what point are you systematically transitioning from marketing to sales? What process are you implementing to convert your leads? These are not easy questions, but if you haven’t pondered them, then, with utmost respect, you don’t have a sales system, nor do you have a methodology of best practices. You’re probably not optimizing your business. Are you, like, you know, kinda’… improvising your sales efforts? Have you fallen into behavioral patterns without having really determined if they are best practices? When a prospect tells you she’s going to think it over, what do you do? Do you have a methodology for probing through tactical questioning to determine if she’s being sincere ? And, if she is, are you helping her put the potential downside of that into words? Do you do so in a tactical way that has a high probability of persuading her to move forward with you? If you typically close new business during your second or third meeting with a prospect, how do you measure success in the first meeting? Do you have a clearly defined indicator for defining the success of first meetings? Are you using this indicator during such a meeting (or phone call) to motivate your prospect to advance more quickly through his purchasing process… with you? Going into the meeting, is this listed as your primary meeting objective on your one-page song sheet? Do you have a one-page song sheet? While it’s ok for startup leaders to delegate in areas where they may be weak, if you are the one selling your services, you weaknesses can kill your sales process… and impact your income. You really do need to identify them and correct them. Avoid this at your peril. S.C.O.R.E. is a sales system that you can plug-and-play as a road map. It is also a tool kit that enables you to build your own sales model while learning/polishing and applying the relevant best practices. For example, your ideal sales model may be a “one visit and close.” So the points at which you use certain sales tools will be different than a “three visits and multiple correspondence” model. You can design this as you learn and apply the related customer-focused sales skills. At the heart of S.C.O.R.E. is a five-step tactical questioning model. Tactical questioning is perhaps the most underrated aspect of successful selling, along with active listening. Over the years, I’ve evolved the S.C.O.R.E. Tactical Questioning model into a complete sales system, from qualifying leads, to securing and opening first meetings, to earning the right to ask questions, to exploring and probing, to handling objections, to securing commitment… and a lot more juicy stuff in between! Since designing S.C.O.R.E. over ten years ago, I’ve implemented it with dozens of corporate clients throughout Europe and North America. So I’ve decided to combine the right components of these sales systems into The S.C.O.R.E. Sales System for Freelancers & Independent Consultants. It won’t be cheap, but it won’t be nearly as expensive as my corporate solution. It will be in the Euro 150.- range. So here’s where you can benefit. Tell me what your three biggest business development challenges are. This way I’ll be sure to address these issues and provide tools that are relevant to you and people like you. 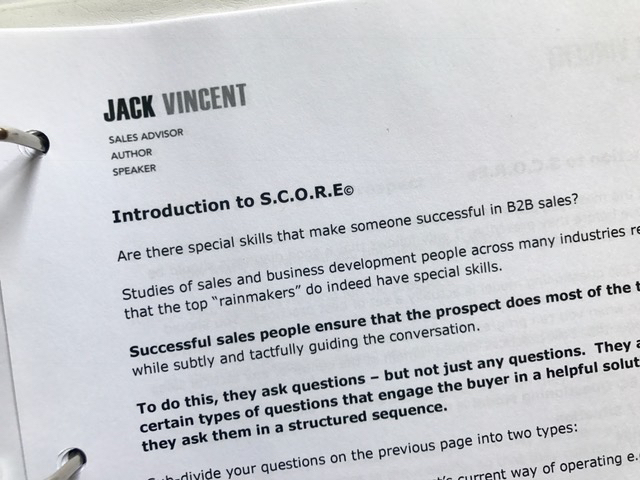 If you send me an email to jack@jackvincent.com listing your three biggest tactical sales challenges, I’ll make sure you get 33% off the list price when the manual goes live on amazon, which will be leading up to the fall selling season of this year. Please put “S.C.O.R.E.” in the subject line. Are you ready to score some new business? Photo of a recent S.C.O.R.E. Sales System & Training Manual.